Before I take this photograph, I check to feel for the stability of Rialto Bridge. I know the bridge is made from marble now. I also known this bridge collapsed many times throughout history. March 2014, single image, additional exposures for highlights, focal length 32mm, aperture f/8, shutter speed 63 seconds, ISO 200, 10-stop ND filter, tripod. Rialto Bridge burned during a rebel apprising. It fell under the weight of a crowd watching a boat parade. It fell lots of times. Finally the powers of be at Venice got it together deciding maybe it wasn’t such a good thing if one of the four bridges across Grand Canal regularly collapsed. In 1524 the city hosted a competition for artists to submit designs for the bridge – Michelangelo was among their rankings. He did not win! The one built all the way back in the 16th century is what I stand on now as I take this photograph of the Grand Canal and Santi Apostoli Church. 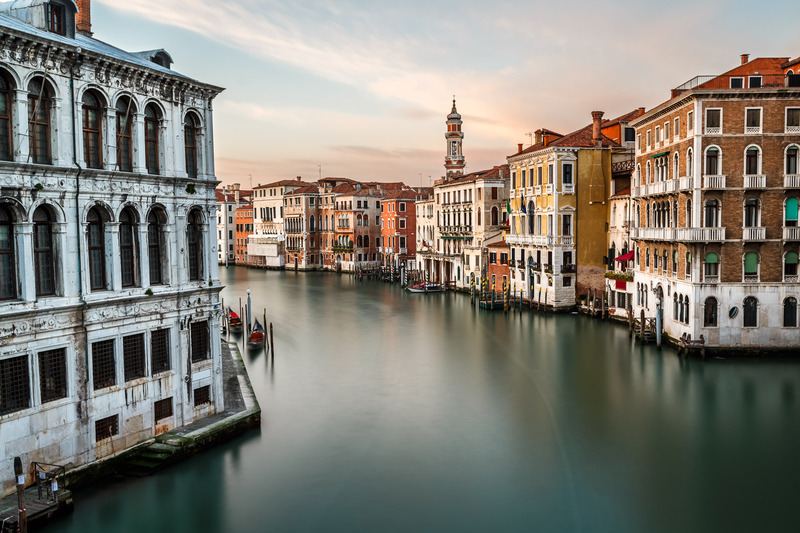 There are pretty two famous perspectives involving the Rialto Bridge: one you are on the Bridge taking pictures of the surroundings, the other you are taking photos of the bridge itself. Arriving more than hour before sunset, I decided to start off with the view from Rialto Bridge. There are number things I like about this composition. First, the contrast between shadow white cold building on the left and brightly lit warm facades and church on the right. Secondly, number of strong diagonals which leads the eye to main object, the bell tower. Lastly, my choice to smooth the water with long exposure forces the eye to focus on buildings details rather than texture of the water. https://blog.ansharphoto.com is amazing website, bookmarked!